New York — H&M will open its largest store in the world, in Manhattan’s Herald Center, on May 20. The 63,000-sq.-ft. store, located at the southwest corner of 34th Street where Broadway and Avenue of the Americas converge, will be the fast-fashion giant’s 13th location in Manhattan. To celebrate opening day, music superstar John Legend will perform and cut the ribbon and twenty lucky winners will be chosen at random for a meet and greet. 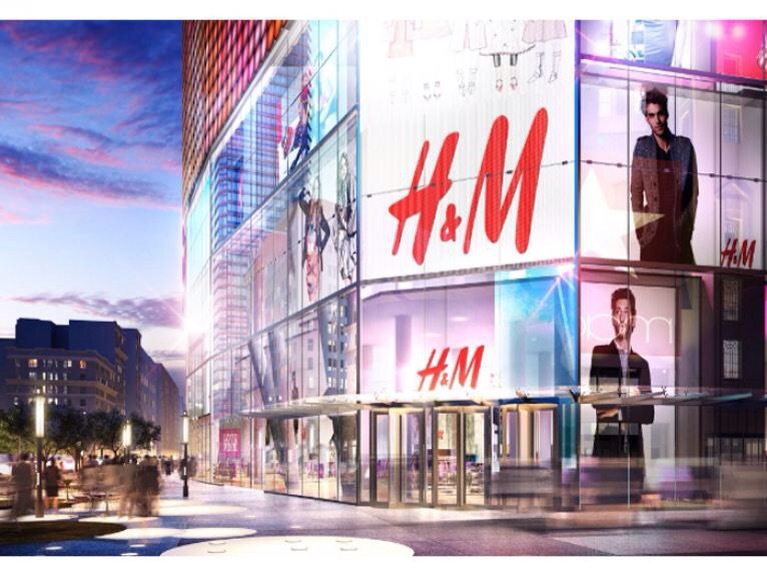 The new H&M, which boasts a custom illuminated store front that wraps around 33rd Street, 34th Street and 6th Avenue, will showcase all of the retailer’s lines, including its home collection and have a special shoe department for women and men. Unique store details will include a custom-designed 35 ft. modern glass facade with LCD screen, mirror and terrazzo tile details, as well as an approximately 30-ft. high atrium on the second level. The store will also feature two main street entrances. The U.S. continues to be one of H&M’s most important expansion markets since its first store opened on New York’s Fifth Avenue 13 years ago. The retailer currently operates 361 locations across the country. The H&M (Hennes & Mauritz) Group has around 3,500 stores in 57 markets including franchise markets. Posted on May 12, 2015, in #international, #retail, #uk. Bookmark the permalink. Leave a comment.